Waheguru Ji Ka Khalsa . Waheguru Ji Ki Fateh! Observing a hunger strike since 16th Jan 2015 and determined to die, I write these last words to you encapsulating the trauma and tyranny of the Indian state to the Sikh people in India. I write these words to reiterate the legitimate historical status and position of the Sikh nation, struggling to find a foothold in a country which is fast turning monolithic and centric under your stewardship and under the dominance of your party and mentors. At 83, I have seen tremendous injustice heaped upon my beloved Punjab and its natives-Sikhs and Punjabis. As a veteran committed Akali, nurtured in the true tradition of the Sikh Gurus, I have consciously owed allegiance to the one and only Omnipotent Akalpurakh Waheguru. With abiding faith in God, I have always stood ground for commitments made in private and public. I have participated in Akali Morchas and struggles without fear and with love and dedication for upholding justice and honour of the Sikh community. I cannot forget June 1984 and the deep wounds of the destruction of Akal Takht Sahib, I will always remember the death dance of India in November 1984 and I cry my heart out recalling the killing thousands of Sikh youth in Punjab and I am disturbed at the continuous imprisonment of individuals who have finished their long prison terms. As I die, I cannot help but rue that the Indian constitution does not recognize me a person belonging to a different faith as article 25 B of the Indian constitution discriminates against me and has taken away my distinct identity. Frankly, at this hour in life, it does not matter to me, as I prepare to meet God Almighty, but the fact that the Sikh people suffer in silence pains me. Throughout life, both as a teacher and a political activist, I have been anguished at the gross human rights violations in Punjab. 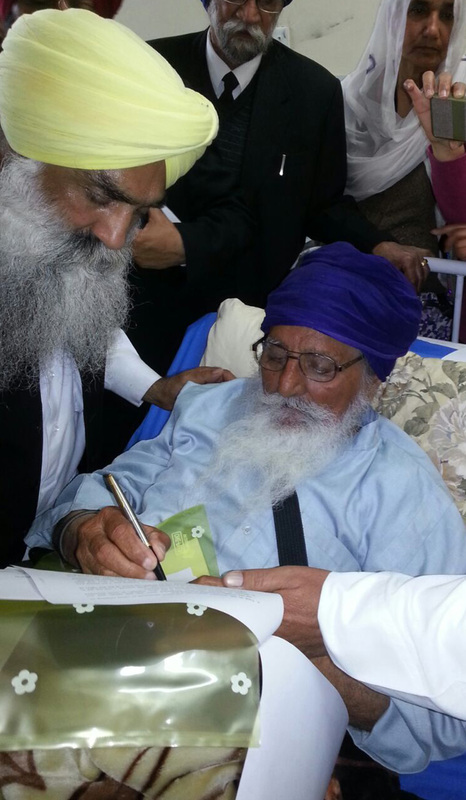 To fulfill the unfinished work of Bhai Gurbaksh Singh seeking the release of political prisoners, I am committed to follow in totality the true Sikh tradition of making a commitment and sticking to it, very ably demonstrated by Bhai Darshan Singh Pheruman in the early sixties of the last century. I have decided to redo “the act of martyrdom”, for if I do not do so, the faith of the Sikhs in God and history will be shaken, for if I do not do so, the Indian state will never take the Sikhs seriously and I will never be able to give a satisfactory reply to my conscience. The question is not about the release of a few Sikh prisoners, the question is about the inalienable right of a person to live life without fetters. The question is about the regaining of liberty after you have completed the full term of one’s sentence in prison. The question is about justice, equality and fair play. The question is about parity between the rich and famous and the poor and the underdogs. The prime question is whether after 66 years of the constitution, does it give the Sikhs the rights and privileges due to them as compared to the oth er majority community? All arms of the state –the bureaucracy, the executive and even the judiciary, connive to delay justice, to circumvent truth and suppress facts. The Sikhs continue to suffer ignominy, indifference and injustice. While Sikh organisations and I demand the release of Sikh political prisoners-who have completed more years in prison than their prison terms, the Indian state counters it with untenable arguments –”the matter is in the Supreme court”, “it is impossible to release “such people”. You know as much as I do that this is only a camouflage to fudge the issue. If governance of the entire country can take the Ordinance route as you and your government has done in the last few months, what prevents state and central governments to take simple steps to release political prisoners on humanitarian grounds? Indian laws regarding release of indeterminate sentence prisoners are open to interpretation and prevarication of the executive. The continued detention of some prisoners not only violates the principle of equality enshrined in the Indian constitution but is also a clear violation of the UN Declaration of Human Rights. I call upon you to treat my dying note as a wakeup call. Rest assured, I will not die in vain. My people will keep the bastion strong and my people will stand up for the rights of political prisoners and the rights of the Sikh nation. I am likely to take my journey into the next life without meeting you. I am pretty sure that this note will disturb you. The Indian state has two sets of laws and their implementation, not based upon equality but perception of the individuals in question –perception of their religion and the ismthat the person follows. This discriminative mindset must change for a pluralistic society to gain currency in the Indian sub-continent. You need to heed the advice of your new-found friend –US President Barrack Obama, who has rightly chastised the Indian state for the stark and dangerous growth of religious intolerance in India. You have reduced everything to You versus Us. For us, it is not so. The ball is in your court. Note- Copy of the letter has been faxed to Prime Minister office.